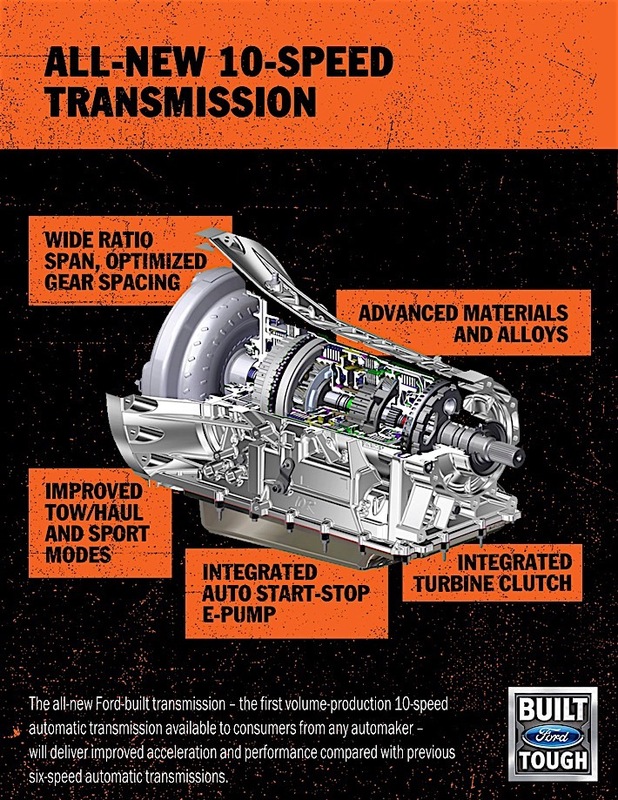 This new Ford 10 speed transmission is going to be the future of trucking. This is leading edge technology and will change everything when it comes to transmissions for pickup trucks. The transmission is much lighter than the older transmissions which in the end is going to produce better gas mileage. This truck also comes with a V-6 eco boost engine which is the lastest in engines for Ford also. The new truck has everything going for it and should become a hit on the market once it gets there. When Ford announced the 2017 Raptor at the 2015 North American International Auto Show, they dropped a bomb about the new truck. No, it wasn’t that it’d be powered by a 3.5L EcoBoost V6, but rather that it would have Ford’s new 10-speed automatic. Having more gears than a Huffy might not sound like something you want in your pickup truck, but it will be something you want. Combined with the new EcoBoost 3.5L in the 2017 F-150, it’ll be a potent combination. Because of the integration that transmission has with the truck’s other systems, in additional to a modified Tow / Haul mode and a Sport Mode, the transmission will also adapt based on how the operator is driving. The 10-speed joins the 2nd-generation EcoBoost V6 in the 2017 Ford F-150, and will also be the transmission used in the 2017 Raptor. With all of this happening for Ford, good things should happen for this company. Read the complete article above to learn more about this product. If you are having problems with your transmission today, then you need to take it to Ray at Tranco Transmission. They are up to date on all the latest inovations when it comes to the current transmissions in cars and or trucks. You will be glad that you did, visit the site here: http://trancotrans.com for more information.